Cinco de Mayo is celebrated on May 5th and is most popular with people of Mexican heritage who live in the southern and western states of the United States, and in some areas of Mexico. It is a celebration of Mexican culture and its customs, foods, music and beverages. Although I'm not of Mexican heritage, I love the bright colors and music associated with Cinco de Mayo celebrations. 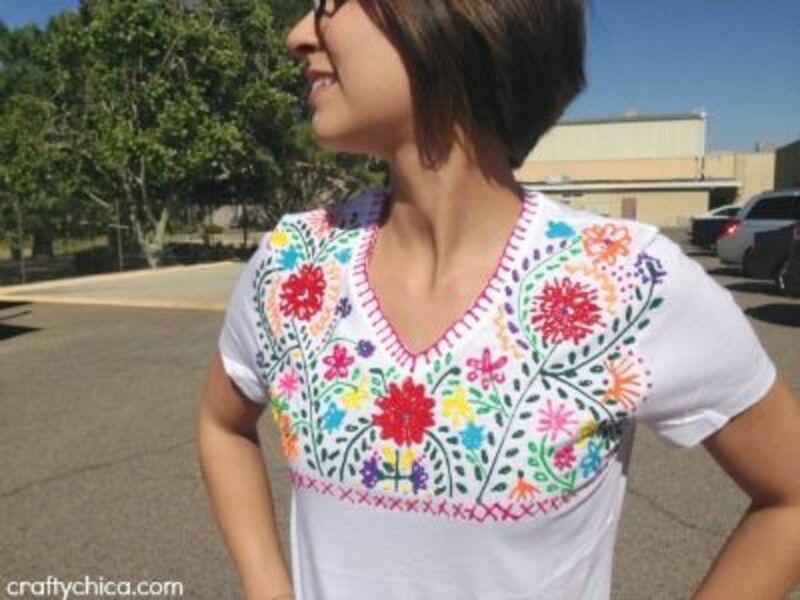 I believe all children will love learning about and making Mexican crafts. 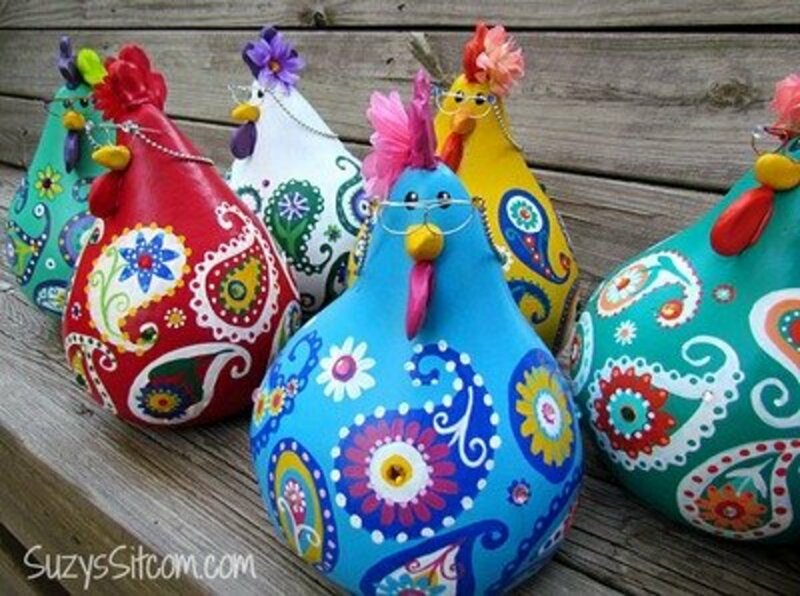 I really didn't know what sort of crafts I'd find in a search for Cinco de Mayo crafts, but I'm really impressed with the ones that I found. I have included a picture and the site name of each craft. 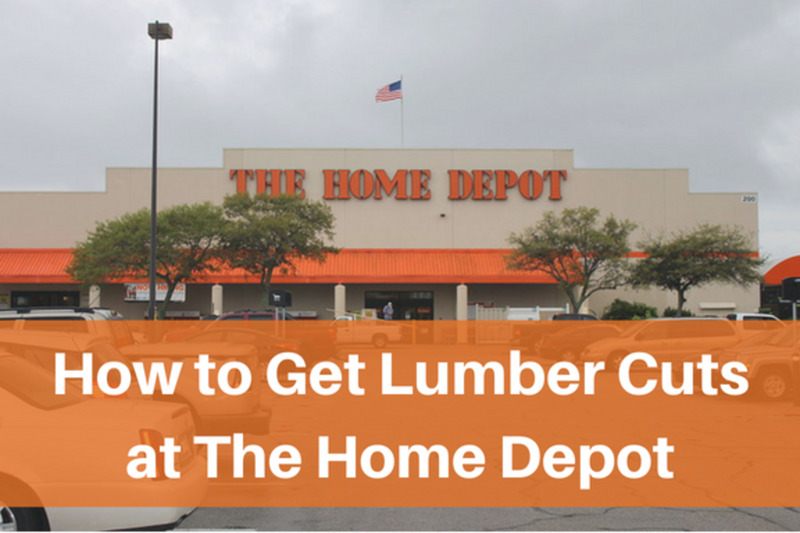 By clicking on the site name, you'll be taken directly to the instructions. 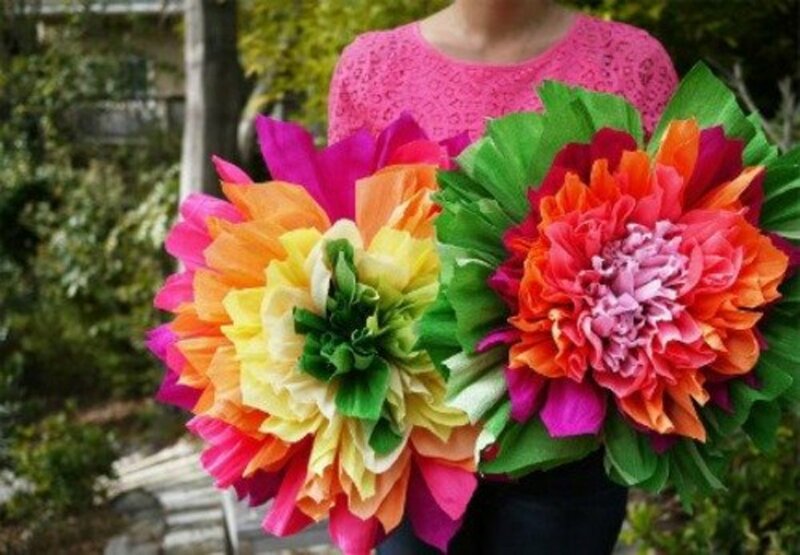 To make the huge, beautiful crepe paper flowers shown above, go to Do it And How for the directions. I know nothing about pottery painting and firing in a kiln, but this Mexican pottery is so very beautiful that I thought it should be included for the crafters that do know about such stuff. 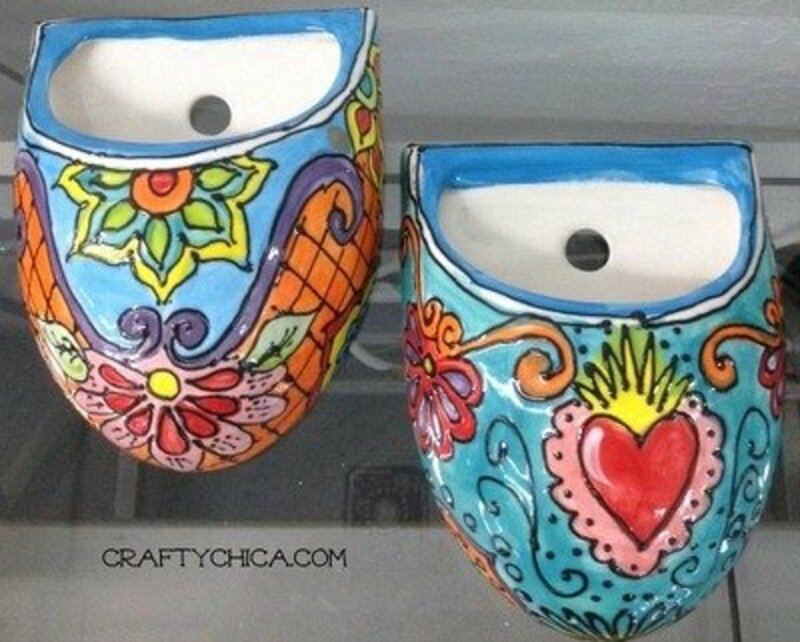 You'll find the information that you need for painting pottery at I LOVE TO CREATE.COM. 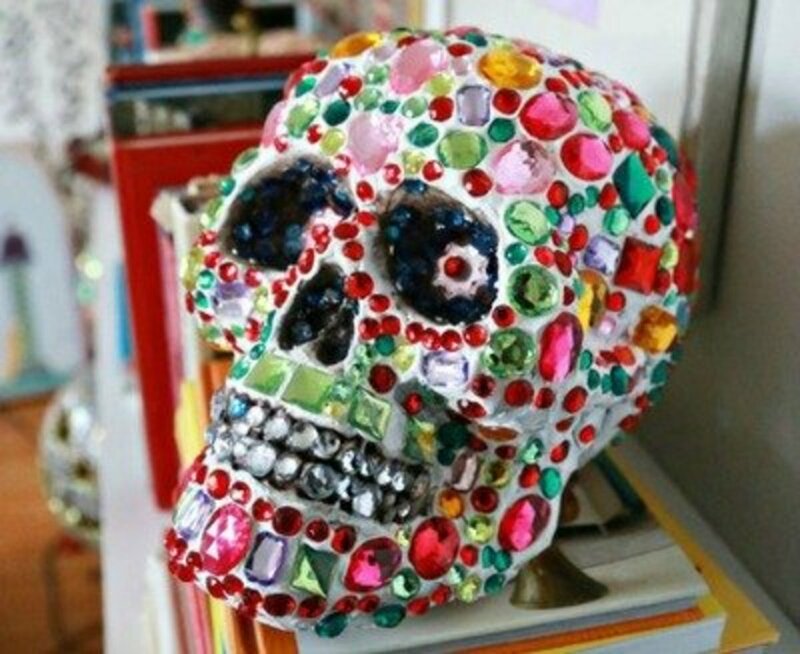 Display this gorgeous gem stones skull all year long. You'll find the tutorial and tips for making your own rhinestone skull at the aunt peaches site. This is a really outstanding project. The kids will have a blast playing with maracas that they've made themselves. 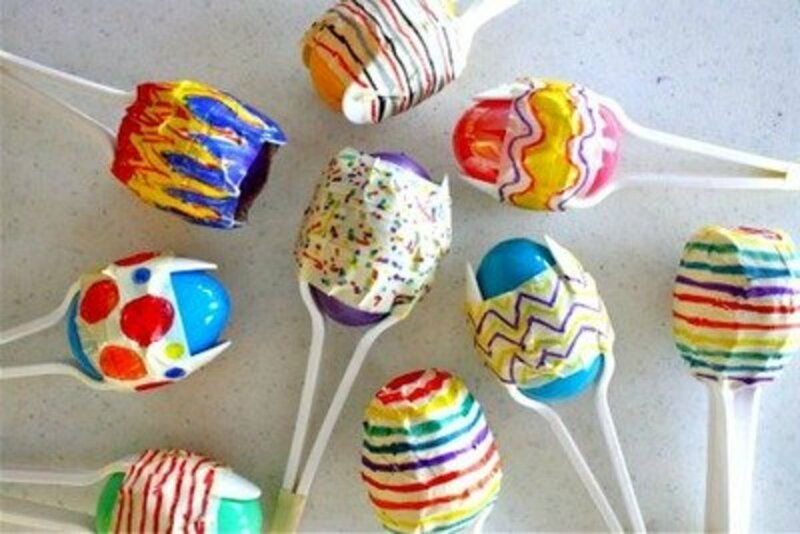 The directions for making these easter egg and plastic spoon maracas is found at dana made it. 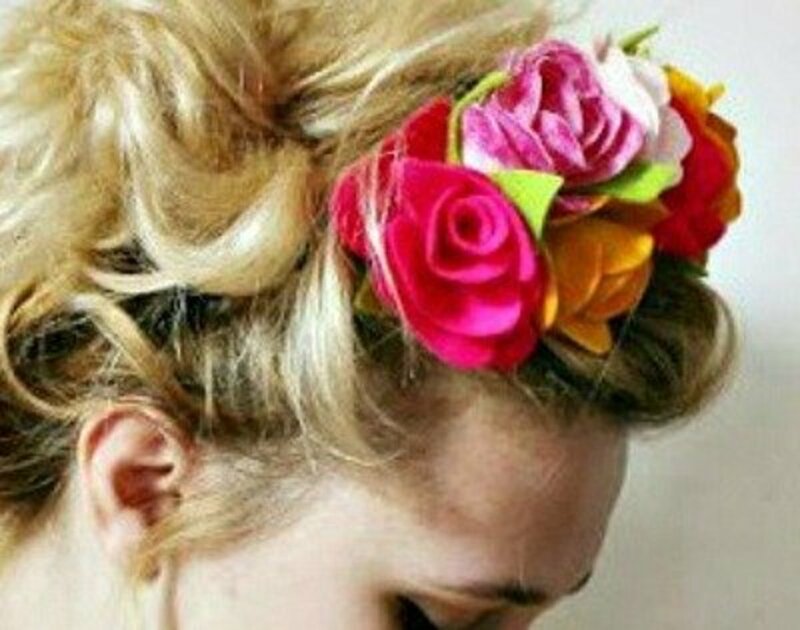 Make a Frida Kahlo inspired floral headband by going to the my poppet Makes site, for the instructions. 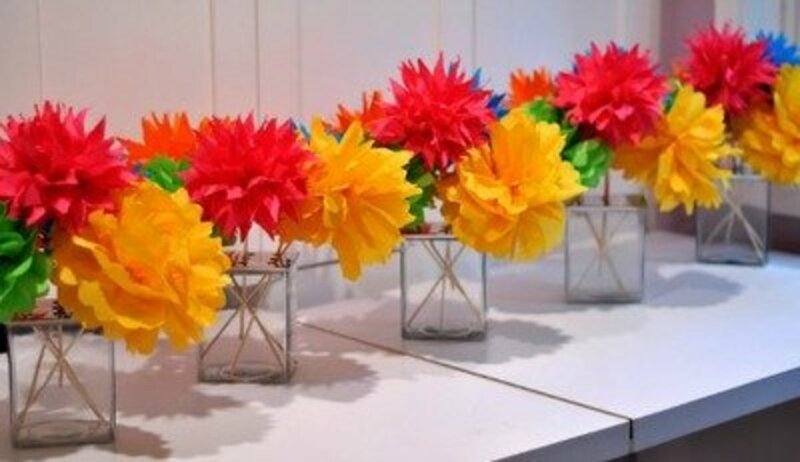 I love the looks of this colorful tissue paper fan garland! 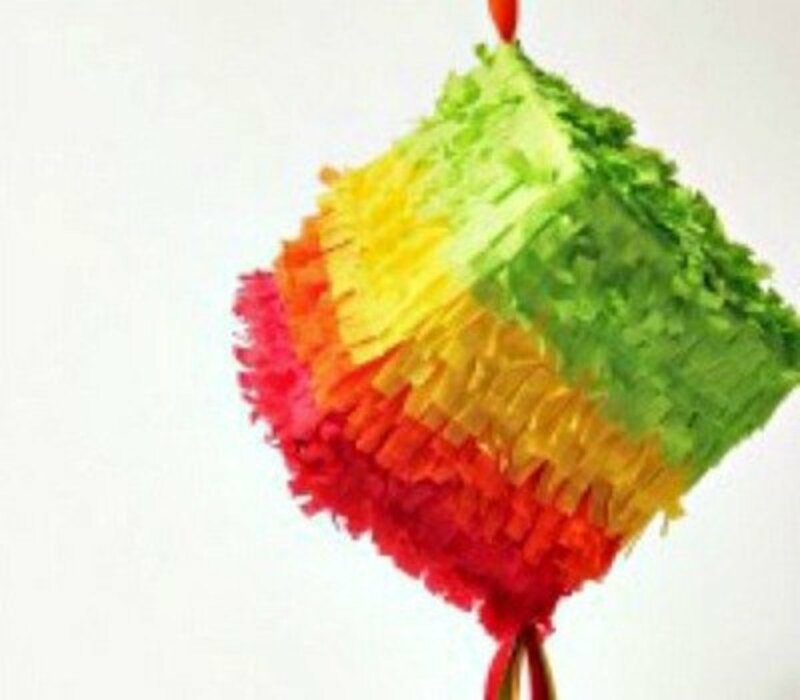 Not only is it perfect for decorating for Cinco de Mayo, it is also very appropriate for wedding, baby and party decorations. Find the tutorial for making this fan garland at THE HOUSE THAT LARS BUILT . Imagine making a cactus from a flat stone. I know, I would never have come up with that idea, but it's a great one. 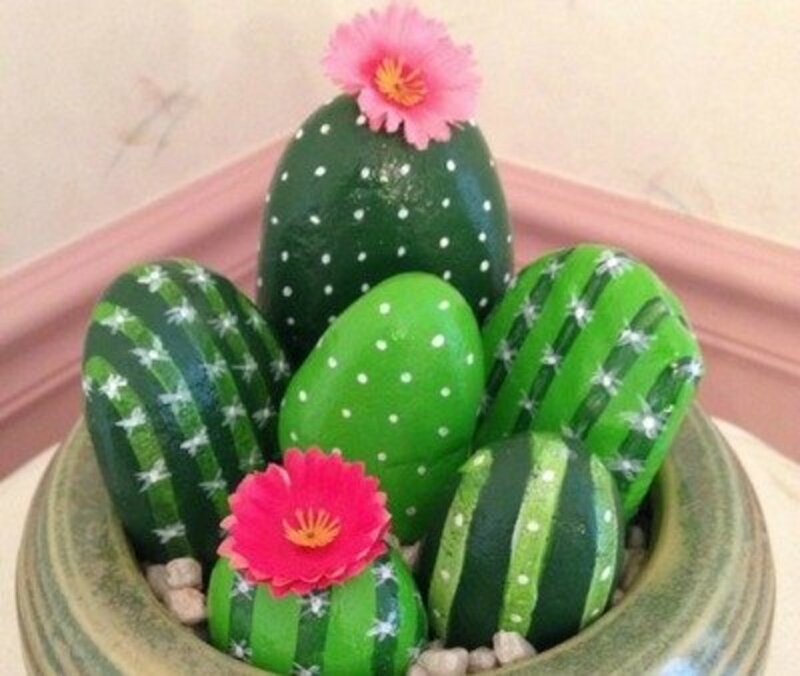 The tutorial for making rock cacti is found at the WHOOT. These are so pretty! And the little cactus plant is such a nice touch as a party favor. 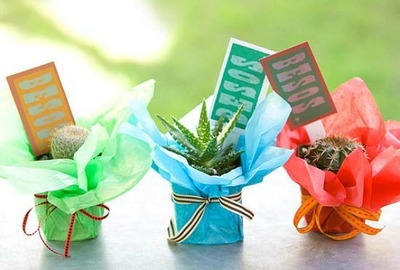 You'll find the tutorial for making these party favors at Better Homes and Gardens. Both of these crafts, the paper cup maracas and the paper cup sombrero, are found together when you visit the red*rook site to find the tutorial. These could also be used as party favors, or glue them on a skewer and add them to a bouquet of flowers for a centerpiece. 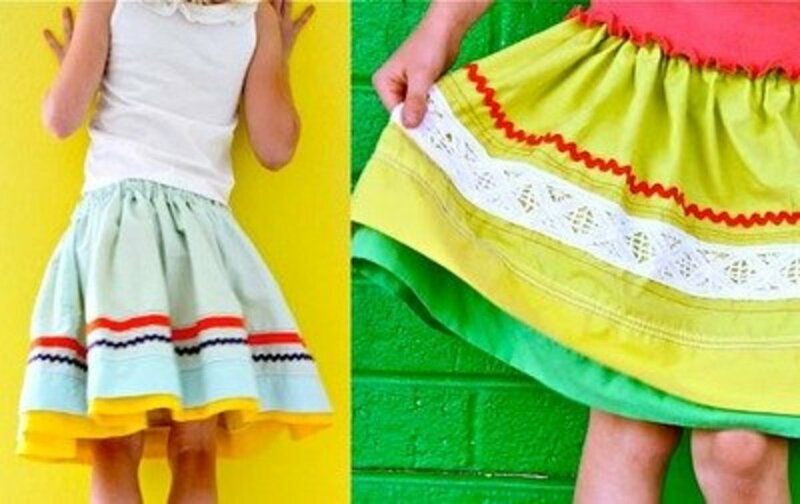 When you visit the dana made it site you'll see a bunch of finished fiesta skirts, so you'll get lots of ideas on how to style them. A very easy and fun project. 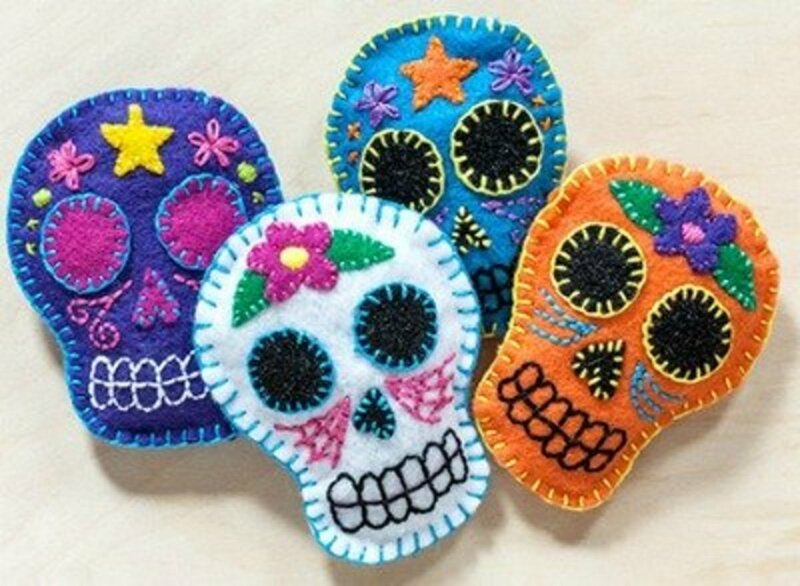 For a really nice party favor, consider making these sugar skull sachets. These would be especially nice if you need a bunch for a group of girls or ladies. You'll find the tutorial for making these sachets at adventures in MAKING. Beautiful! 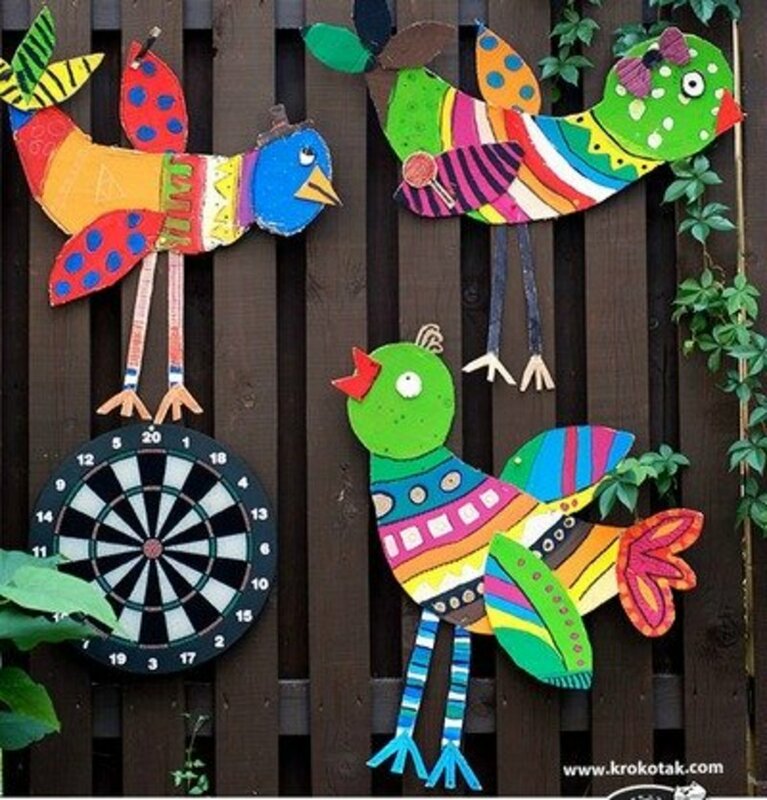 I can't wait to make these cardboard birds with my granddaughters. 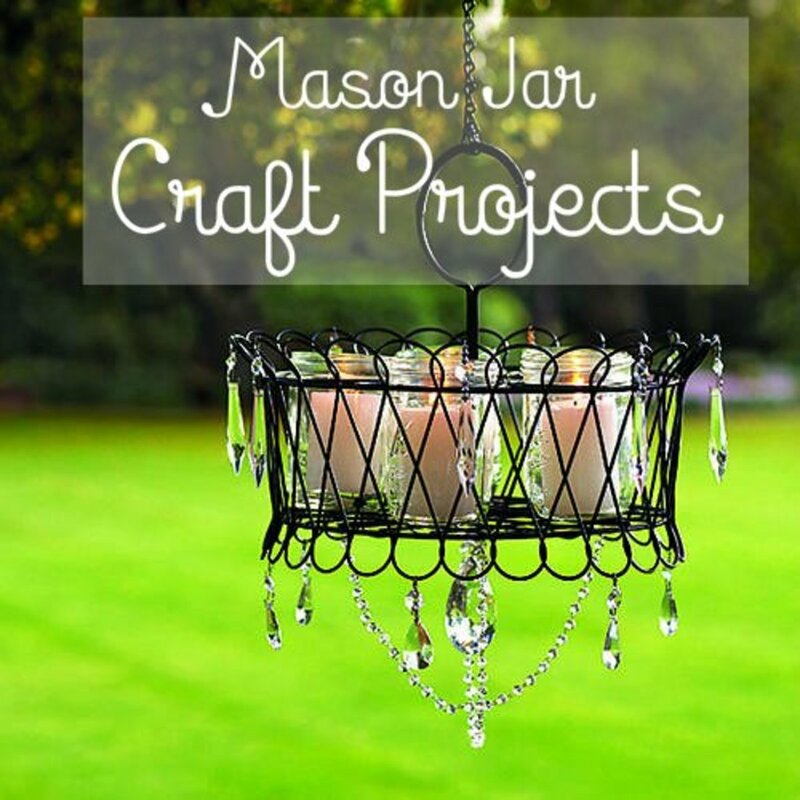 I love projects that you can really customize to make it your own. Check out the directions at KROKOTAK and make some big birds. 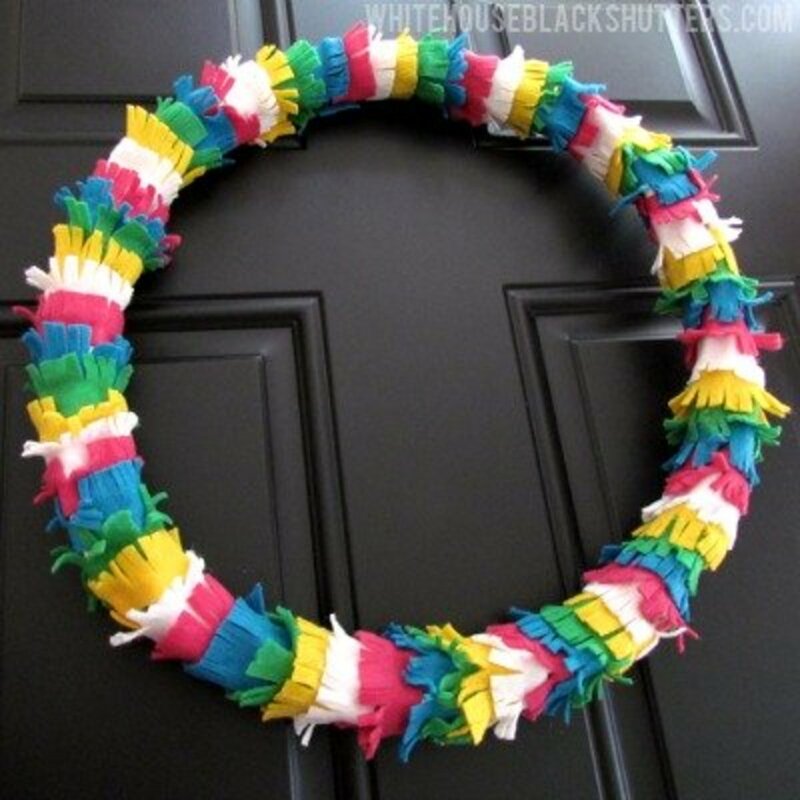 When I first noticed this wreath I thought the fringes were made using tissue paper, but when I looked closer, I see that they are made using felt pieces. 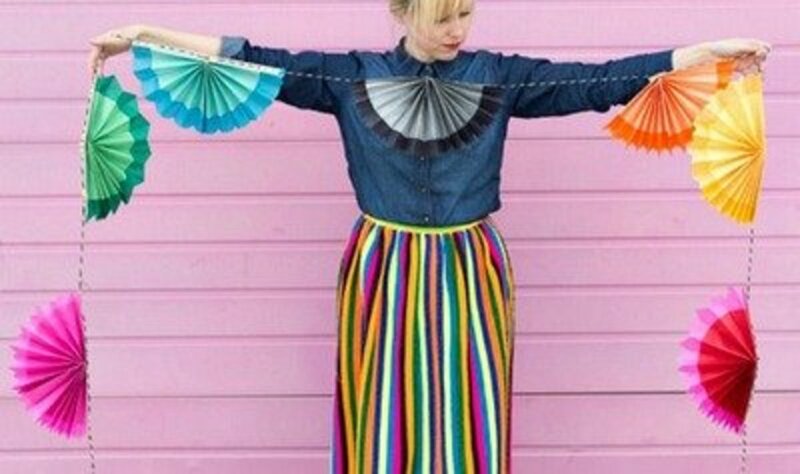 Making a pinata party wreath like this one will be easy by following the tutorial found at WHITE HOUSE BLACK SHUTTERS . Muñeca Quitapenas are dolls that remove worries. 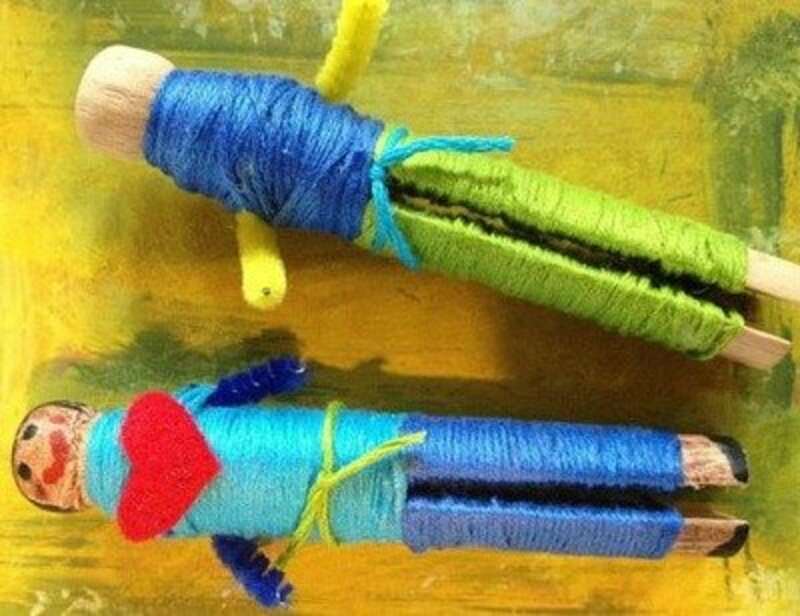 Worry dolls help ease the child’s worries or can be used to make wishes. The doll is told the worry, then placed under the child’s pillow. The doll does the worrying while the child sleeps Make a worry doll for someone you love by going to creativity in motion for the tutorial. 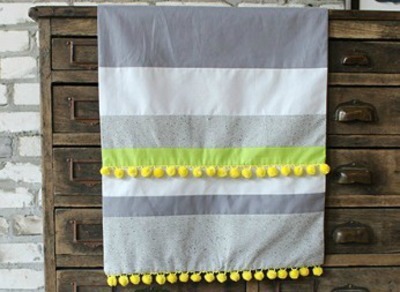 I love this grey and yellow table runner, but can imagine how beautiful it would also be made using bright colors. To see how to make this fiesta table runner, go to sew mama sew. 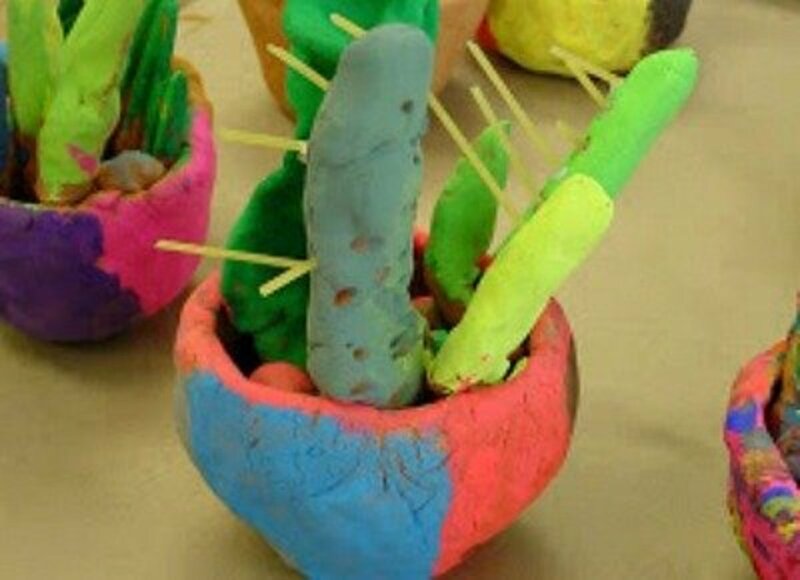 I would love to make these beautiful pinch pots with a group of school children. They always enjoy using bright colors and dreaming up ways to decorate a piece of art. 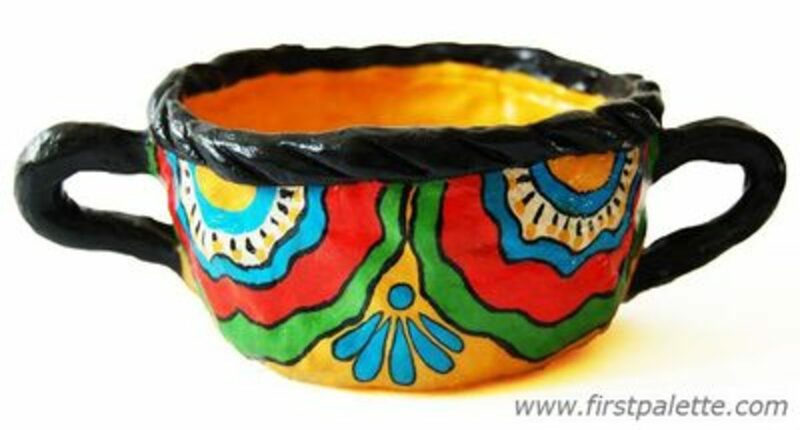 If you would like to make a Mexican pinch pot like this one, go to firstpalette for the tutorial. Looks like this would be as much fun to make as it will be to play. The directions for making the tambourine is found at Kix. 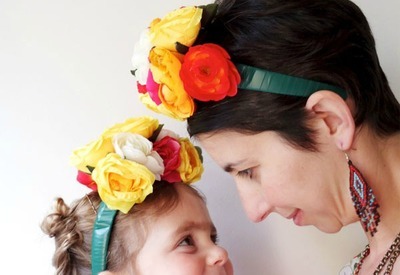 You'll find a great picture tutorial for making these headbands at My poppet. 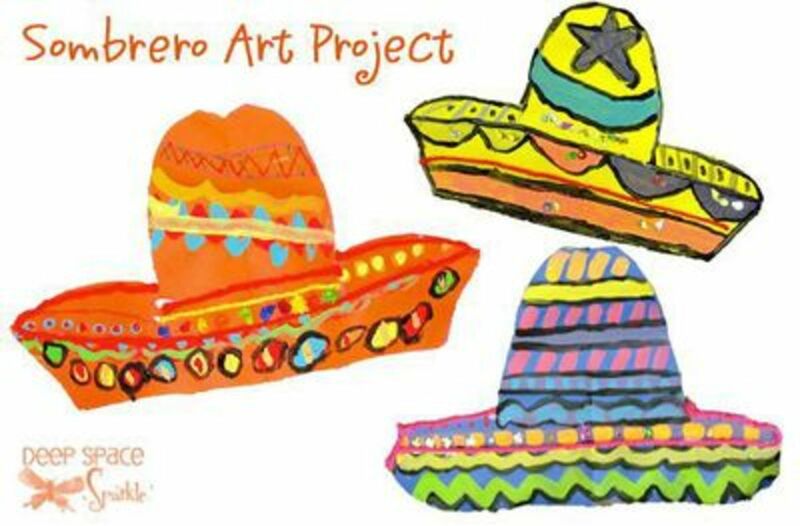 If you are searching for a nice classroom art project that all the elementary grades could do, I think this sombrero art project is perfect. Go to DEEP SPACE SPARKLE for the instructions for making this art project. 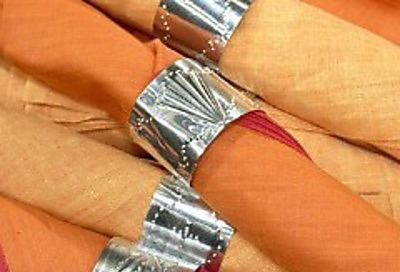 Punched tin napkin rings are great for all year round use. Make them for a Cinco de Mayo party by finding the directions at the Martha Stewart site. 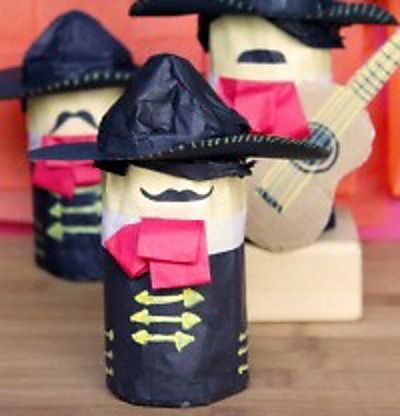 Make decorating for Cinco de Mayo quick and simple by using printables. You'll find the printables for the patterned paper to use for the paper rosettes and the senoritas at denna’s ideas. The rosettes are so beautiful and can be used in so many different ways. This is an exceptional classroom project, and it can be used so beautifully in decorating for Cinco de Mayo. Find the instructions for making this Mexican tooling art at Kinder ART . 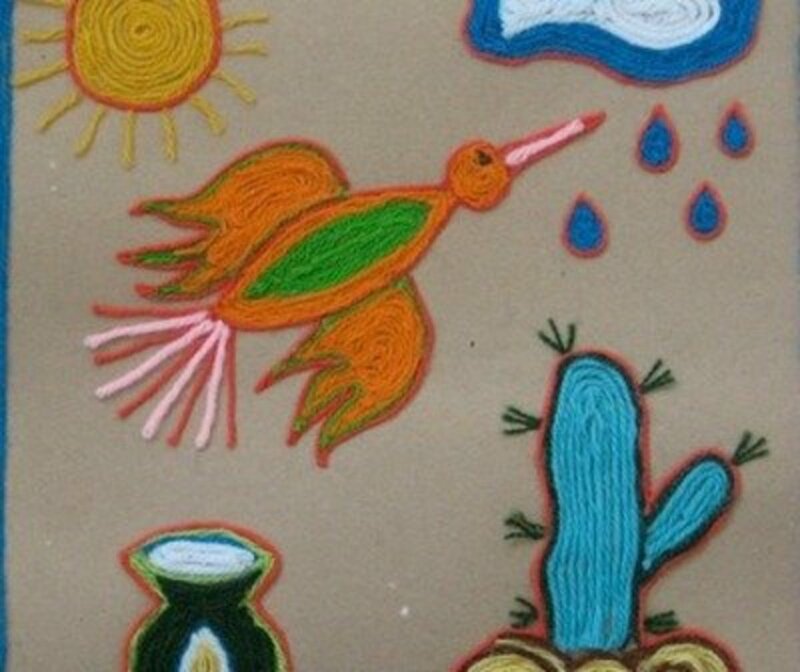 Making Cinco de Mayo Huichol yarn pictures is a nice classroom art project. 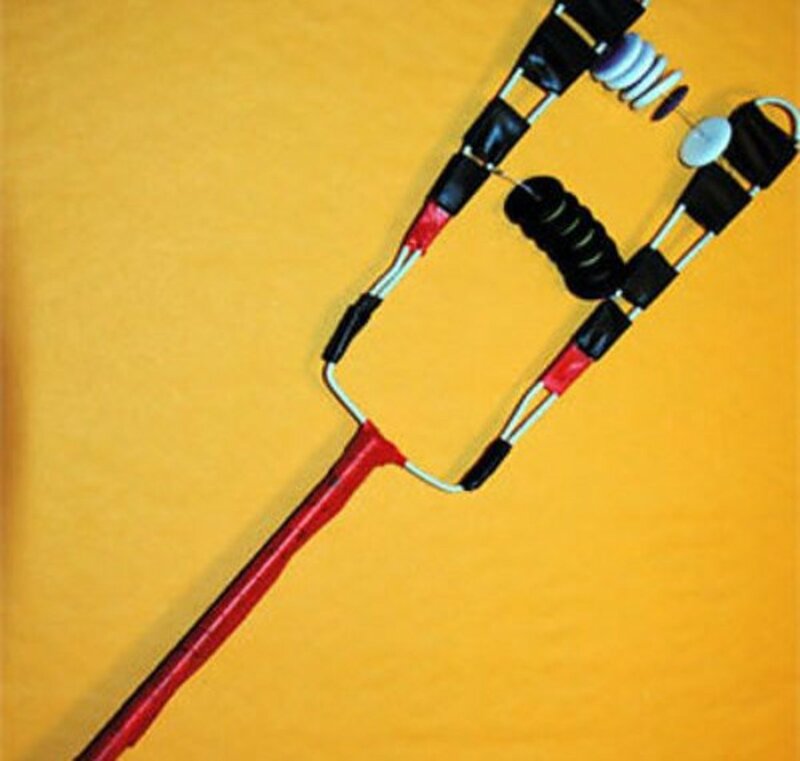 You'll find the instructions for this project at education.com . Beautiful and educational. 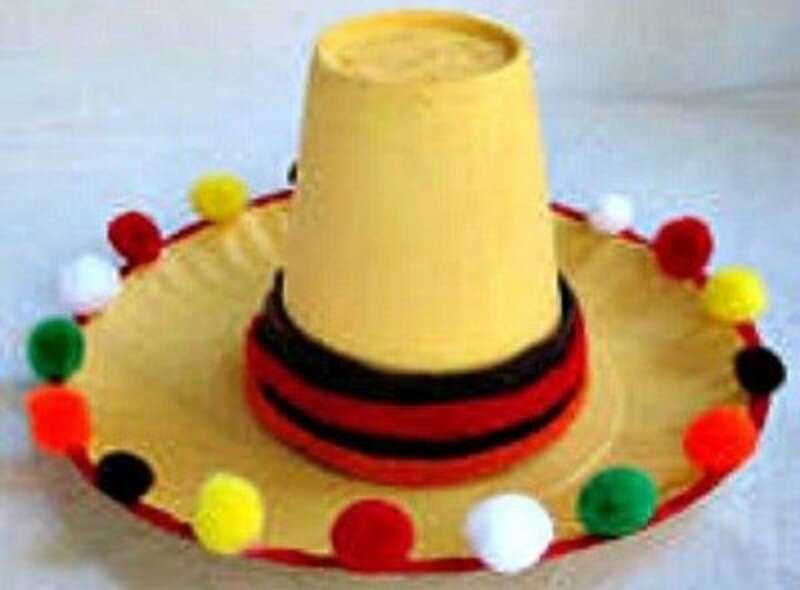 I particularly like this paper plate maracas project because even the littlest kids can help, or make, them. Consider this for a classroom project for K-3 grades. 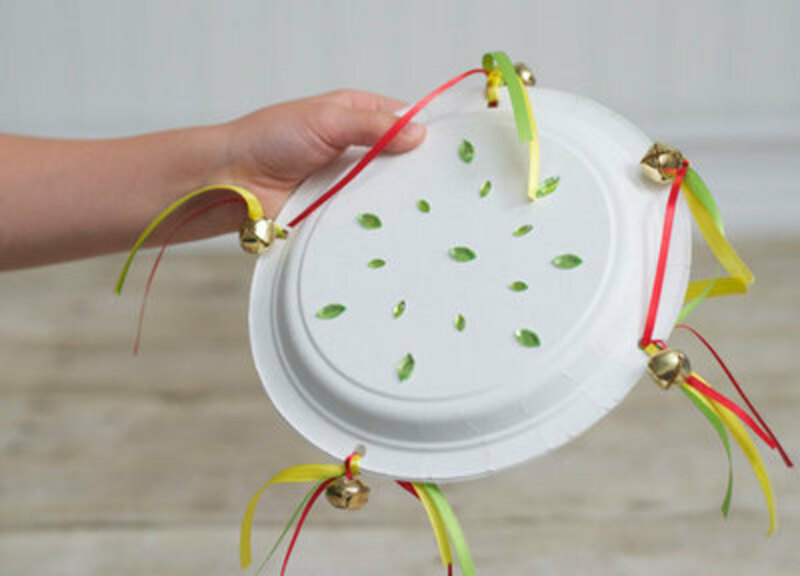 Find the instructions for making the paper plate maracas at scattered thoughts of a CRAFTY MOM. 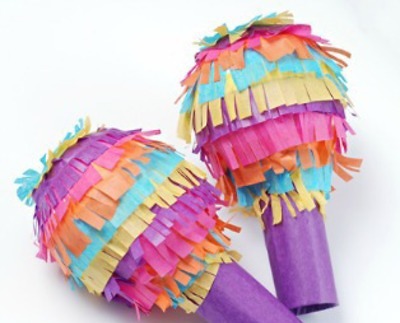 Aren't these mini pinatas just the cutest thing ever? 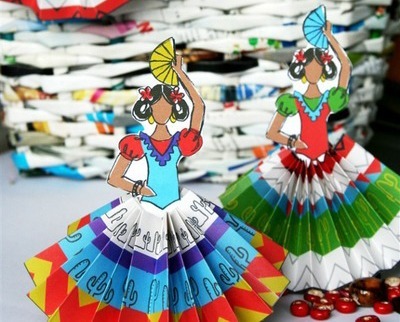 They are made using toilet paper rolls and colorful tissue paper. Find the complete tutorial by going to the HIDEOUS! DREADFUL! STINKY! site. I'm going to do this with my grandkids this summer, I think they are so cool. I can imagine the kids would love giving them as gifts to mom or dad too. 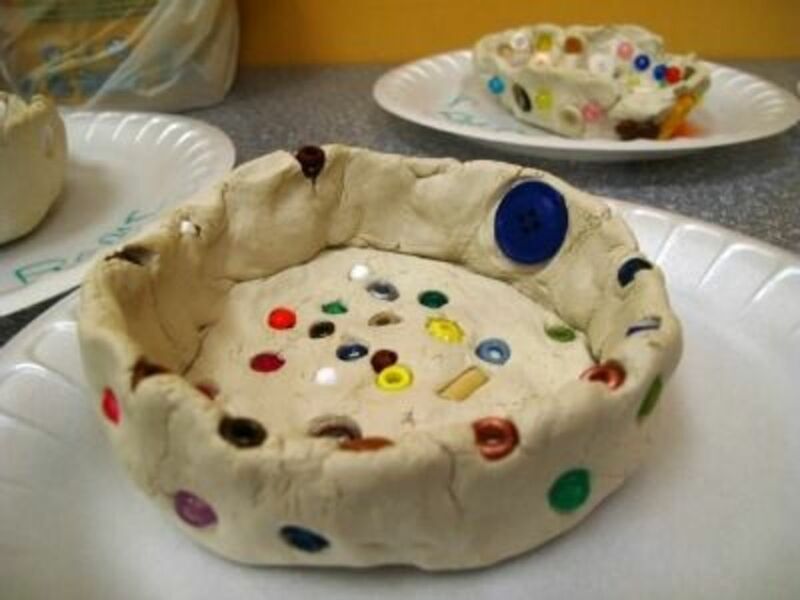 Find the directions for making these clay pinch pots at Laugh, Paint, Create. 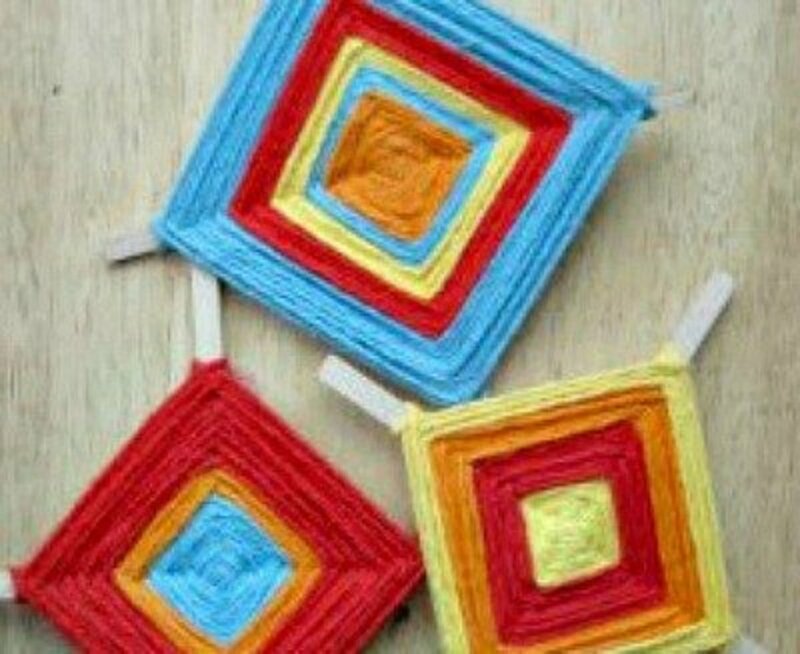 So many of these crafts look like so much fun that it looks like we could keep the kids busy all summer. Go to DLTK for the instructions on making Mexican bird rattles. 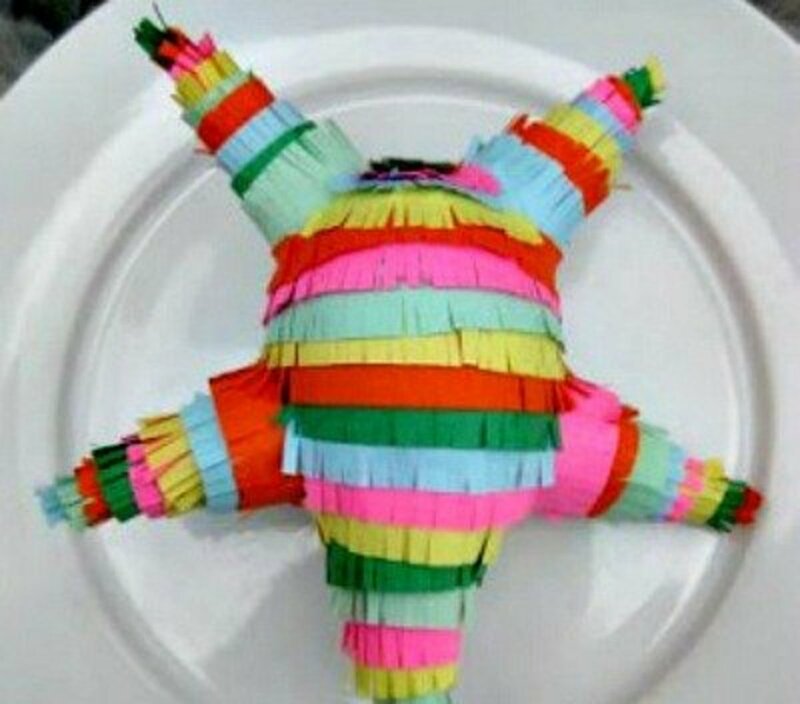 Here is another great mini pinata idea. 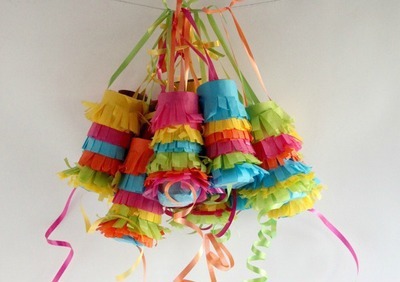 Make these super cool pinatas, a Mariachi band, by going to HIDEOUS! DREADFUL! STINKY! for the tutorial. 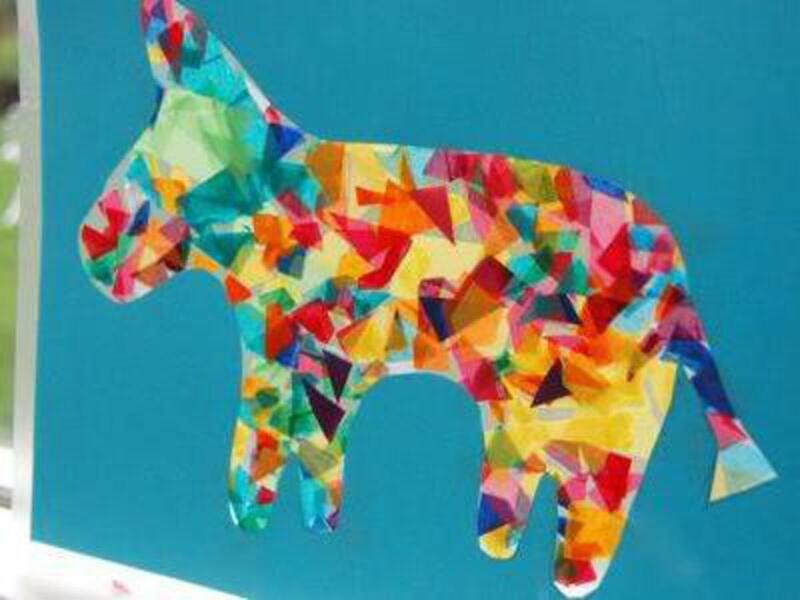 You'll really enjoy making these mini donkey pinatas using the patterns and directions that you'll find at OH HAPPY DAY. I absolutely love these cactus plants that were made by Mrs. Knights Smartest Artists. 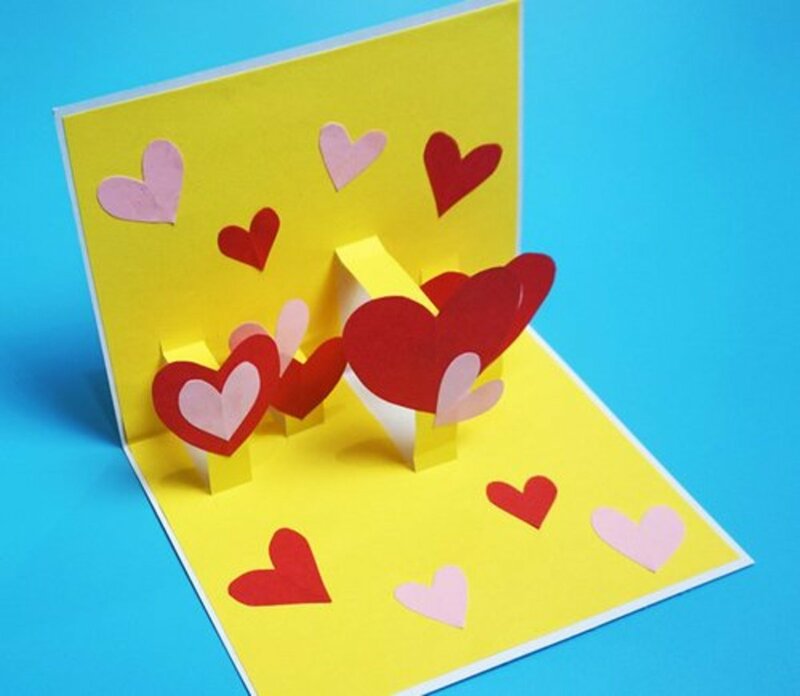 The kids could make these to give to their parents as gifts or to decorate the classroom. I love this project. 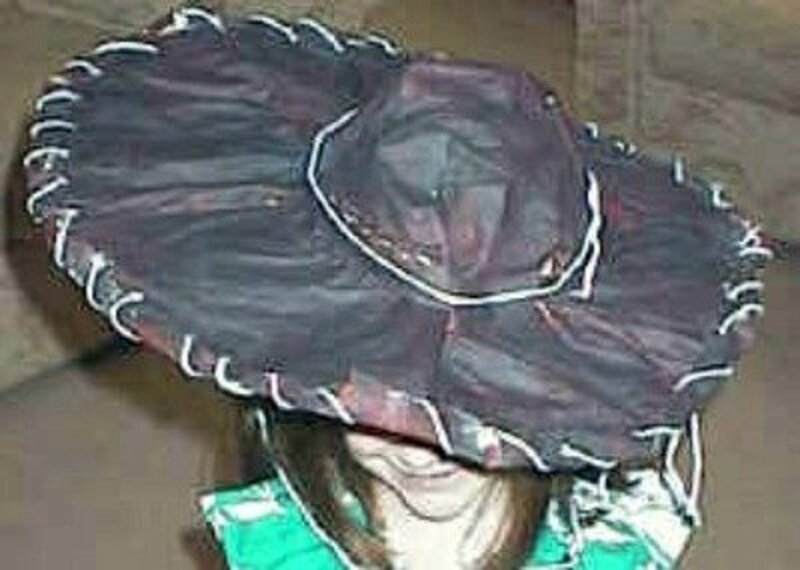 You can even make some bright flowers to decorate your sombrero. 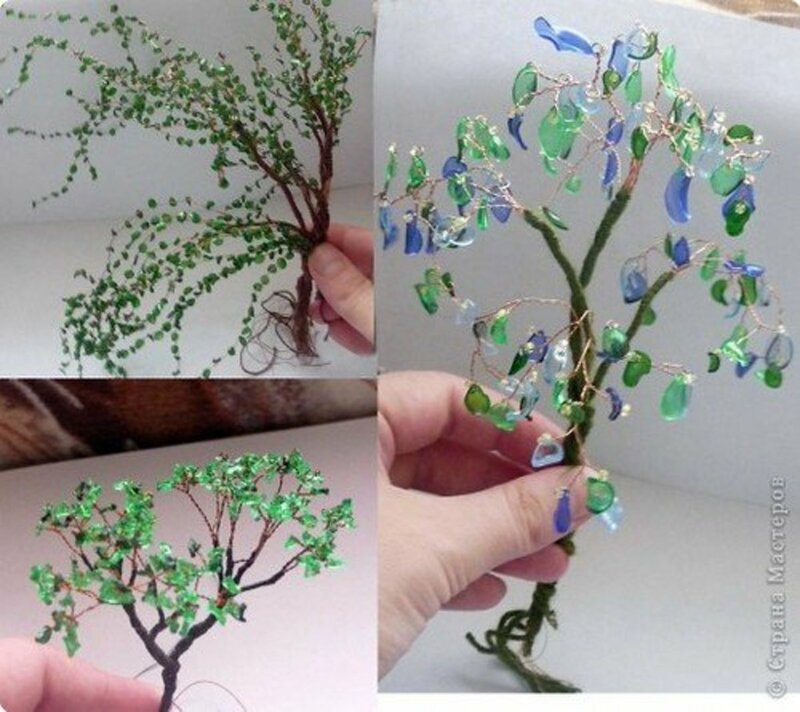 This really nice craft project and the directions are found at DLTK. 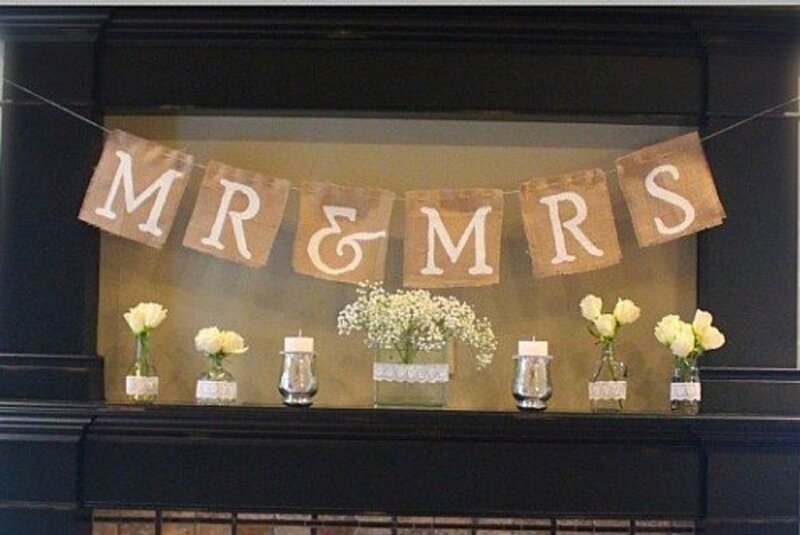 Another craft I'm going to have to do!! After your Cinco de Mayo celebration, use these beauties for a patio party. 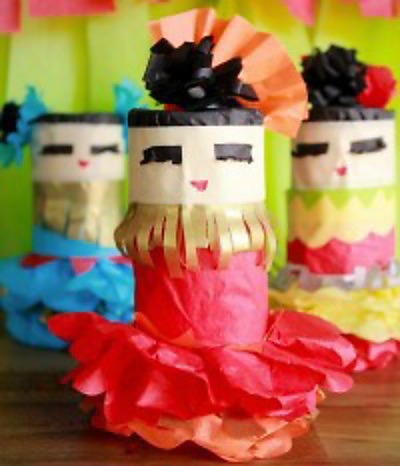 Go to Aesthetic Nest to see how to make these flirty, fiesta flowers. I can just hear the enthusiastic comments made while these masks are being made. 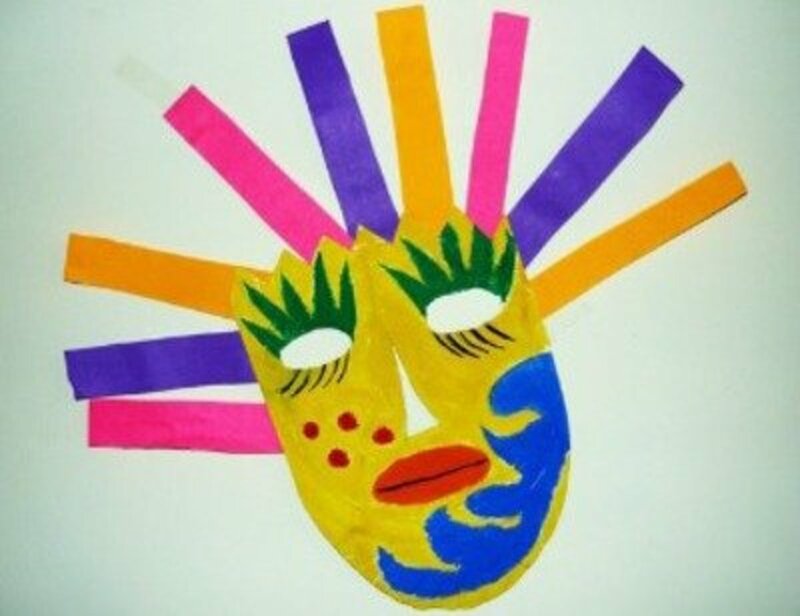 Have lots of fun making these masks while using the instructions found at JUMPSTART. 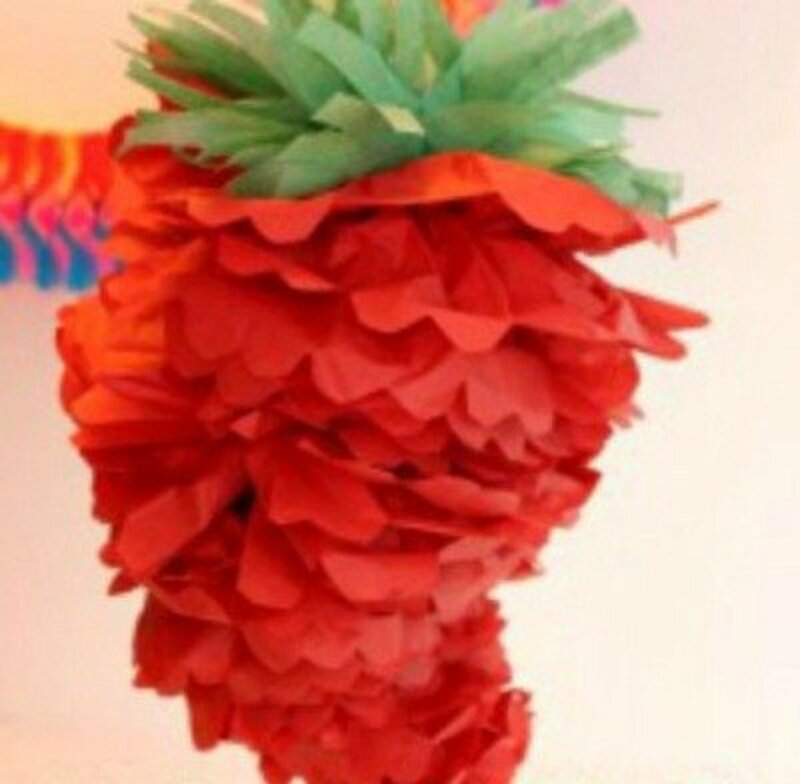 You'll find a photo of the garland and the directions for making these pull pinatas at LOVE + CUPCAKES. I think they look really beautiful all bunched together like this. 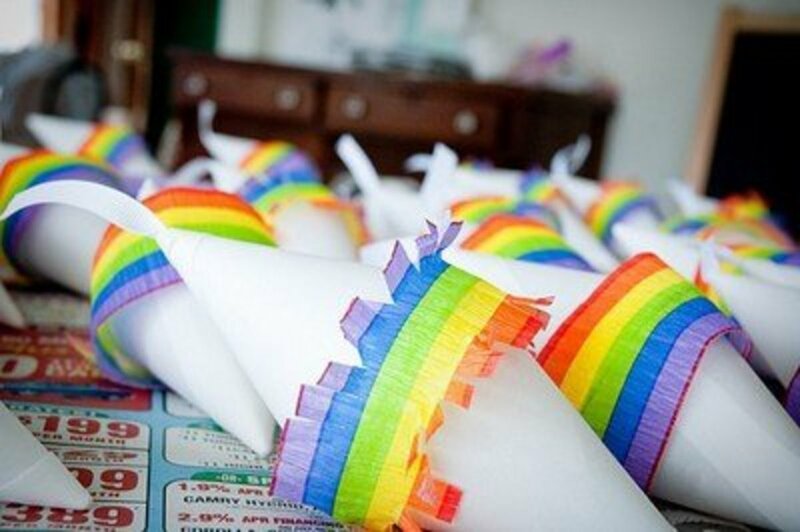 Such cute little pinatas made using cone cups. 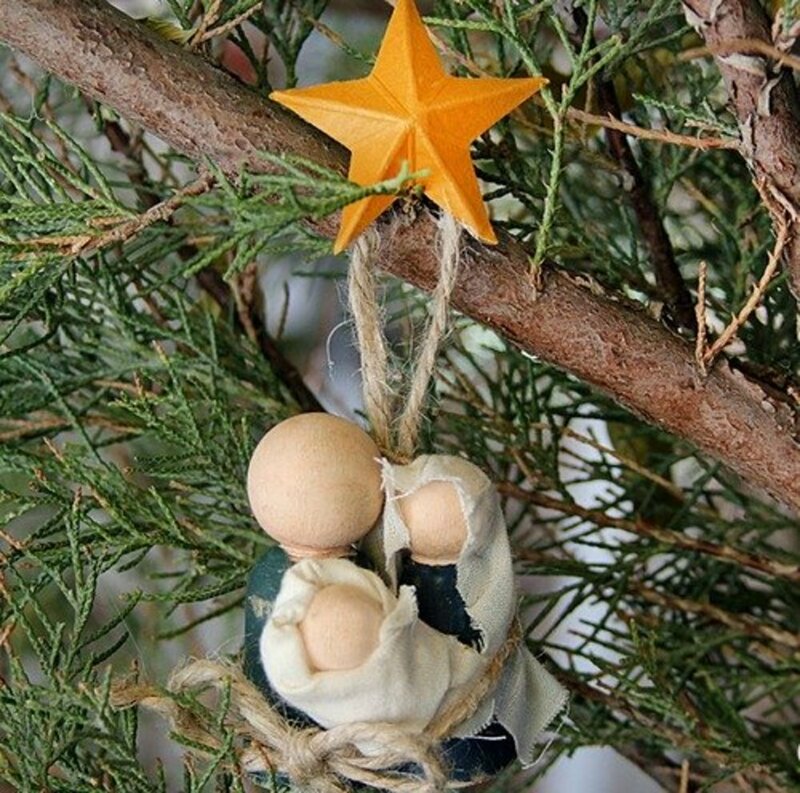 Find the directions for this charming craft at Jodi Michelle. 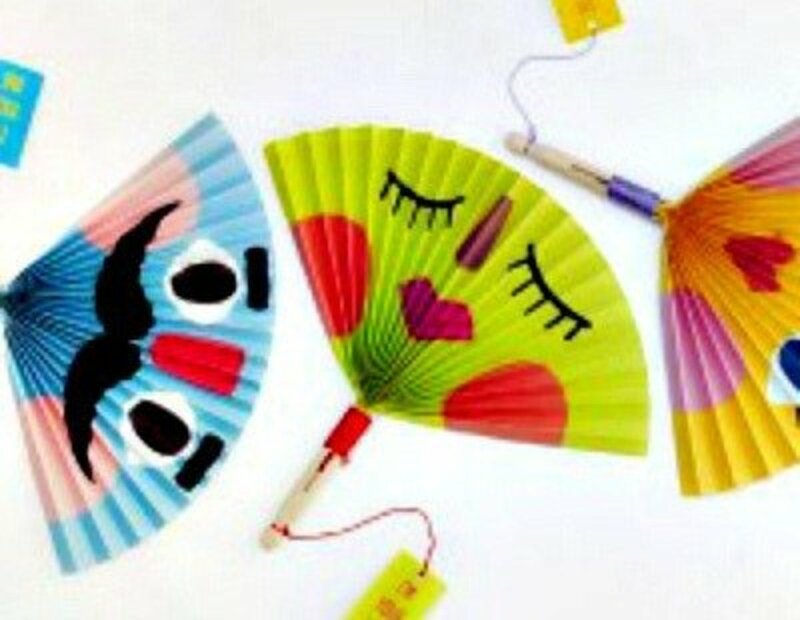 You can make these fans using the printable version, or you can use your imagination and make beautiful Mexican prints on the paper before making your fan. MR PRINTABLES has the printable version of the paper fans. 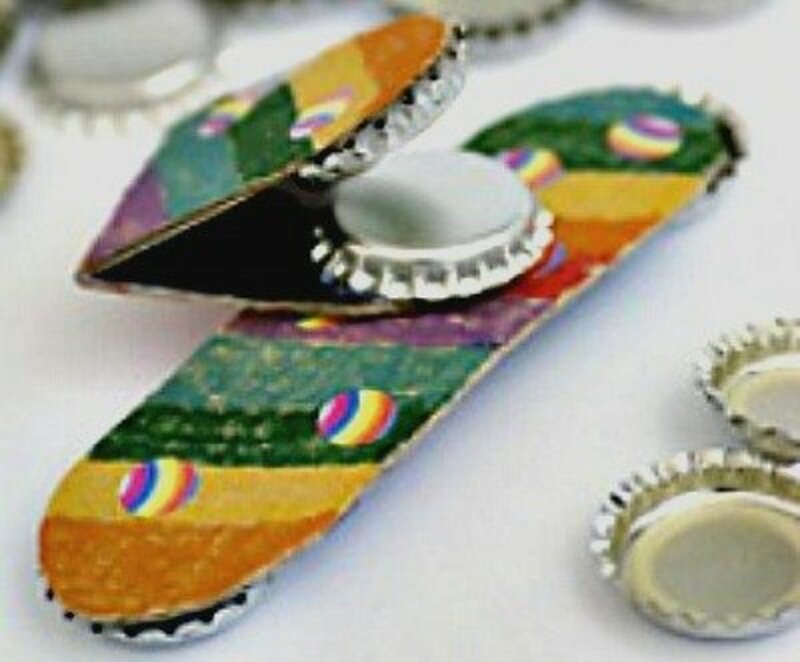 I can imagine so many of these crafts used for many summer parties. Decorate your patio and have the neighbors over for some tacos. Find the easy instructions at OHMY!Creative. This God's Eye craft is another of the projects that I think would make great gifts. Go to Muffin Tin Mom for the instructions. 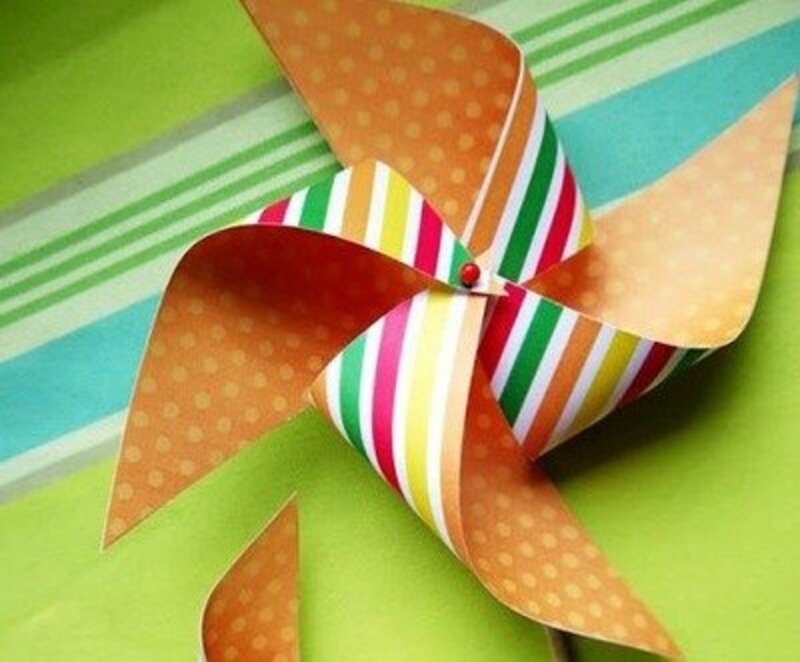 Bird’s Party Blog has the directions and a video showing how to make the pinwheels and using them on cupcake tops. 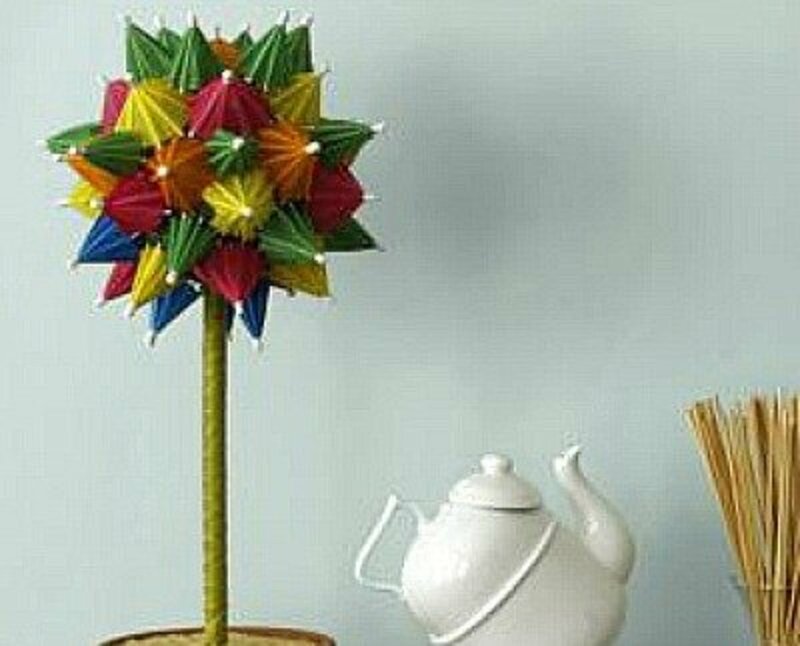 I've also seen pinwheels arranged in a vase and also added to plants, so there are lots of ways to use them. 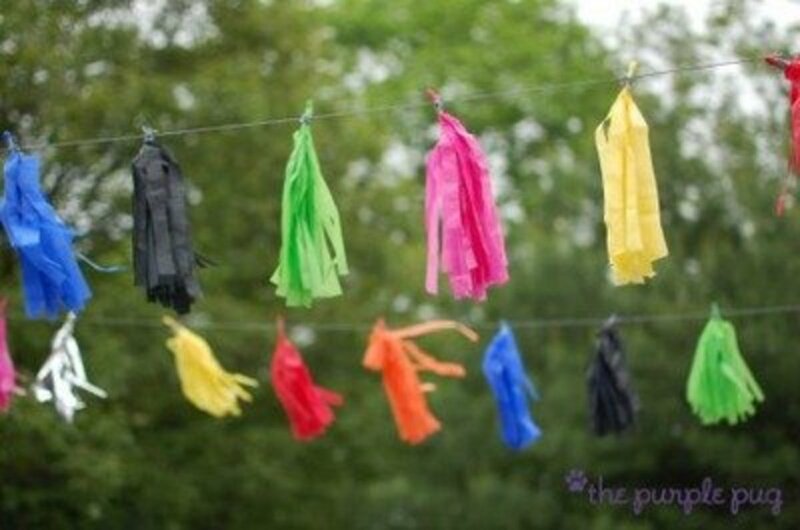 Decorate for a party using tissue paper tassels like the ones you'll find at catch my party. You'll find the directions there too. 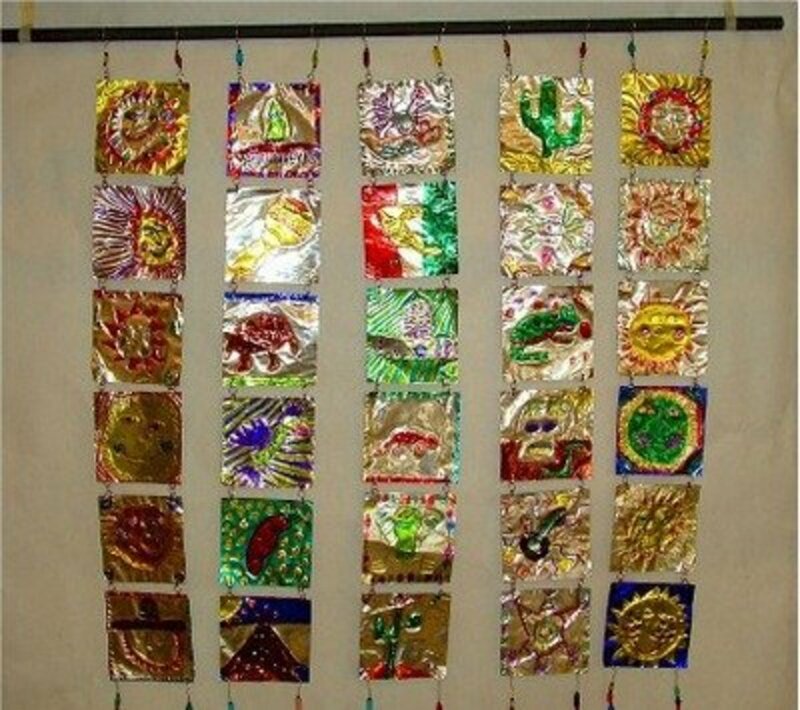 Celebrate Hispanic heritage month by making this beautiful metal sun wall art. 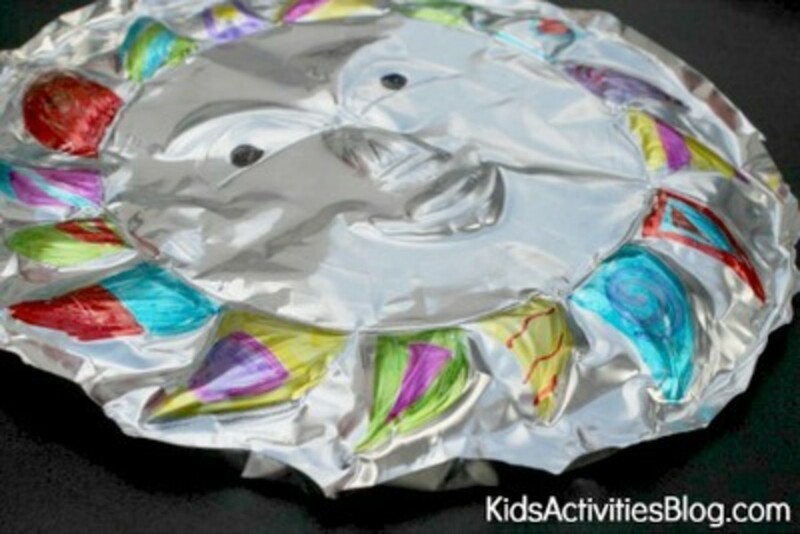 The kids will love following the instructions at kids activities Blog to make their own sun art. Make your own musical castanets using the instructions that you'll find at education.com. 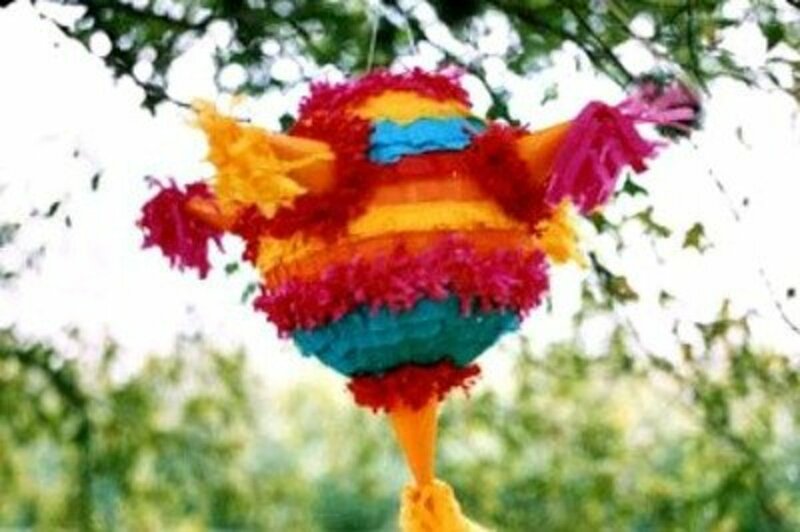 This fiesta pinata and the directions for making one like it, can be found at Martha Stewart. 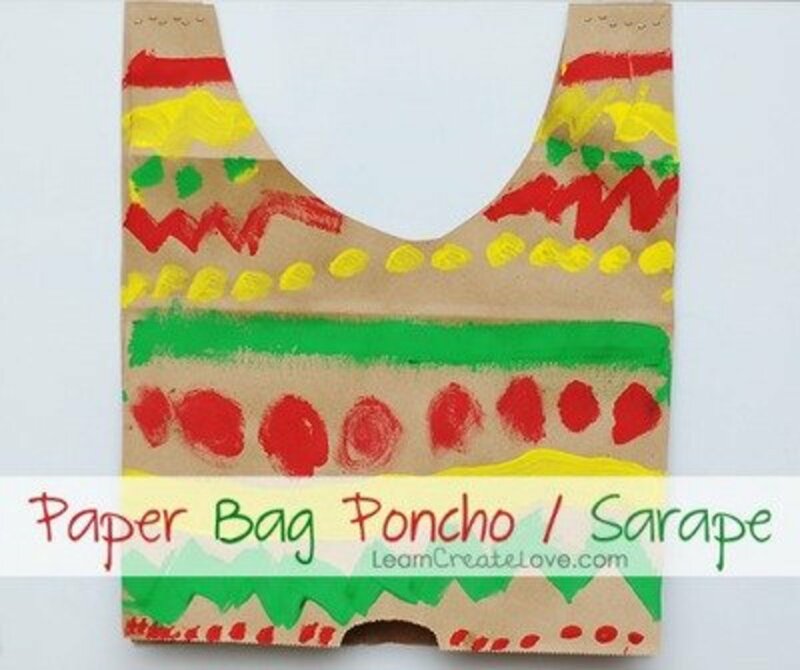 If you are looking for a nice activity for the kids to keep them occupied while you celebrate Cinco de Mayo, consider getting out the brown grocery bags and some craft paints for the kids to make these ponchos. 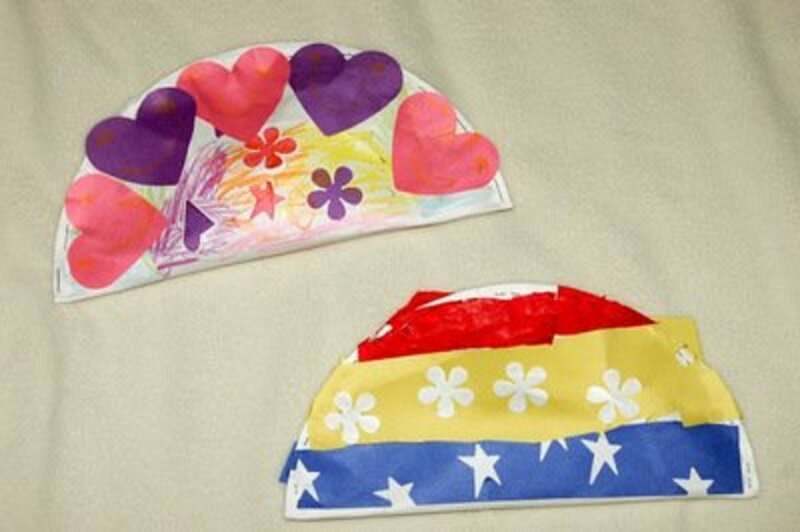 The kids will have a blast decorating their poncho or sarape following the instructions at learn create love. 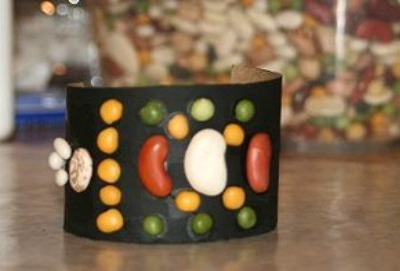 Macaroni Kid shows us how to make a very nice bracelet decorated with dried beans. I'm impressed with this craft and think I'd probably use some macaroni on the bracelet too. 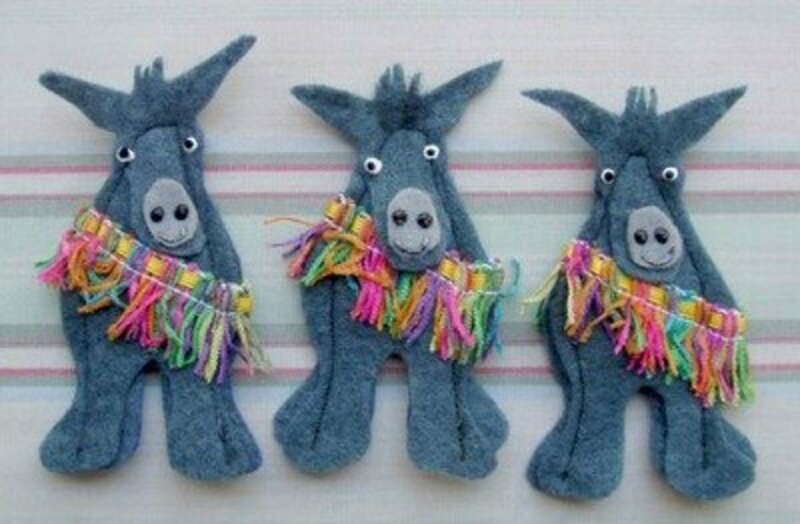 Make these really cute little burro finger puppets by following the tutorial that you'll find at Crack of Dawn Crafts. A project to be enjoyed by both kids and adults. The beautiful colors of the paper umbrellas make this an outstanding Cinco de Mayo decoration. Find the tutorial for making this topiary at craftstylish. Who would believe these mini pinatas start out as plastic Easter eggs. A very cute and easy to make project to do with the kids. Go to Mega Crafty for the tutorial. You still have time to make this beautiful faux embroidered shirt before May 5th. Nothing could be easier than to embroider with fabric puffy paints. You can make a shirt like the one shown above by going to CRAFTY CHICA for the tutorial. 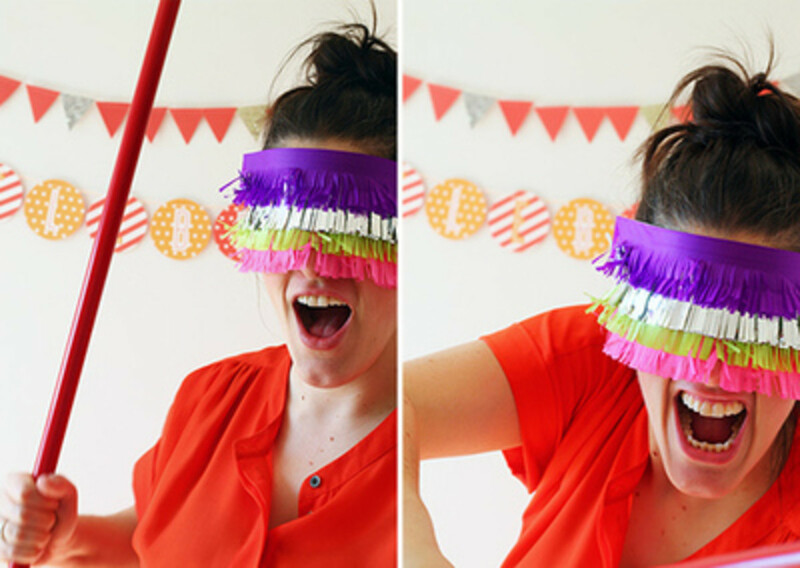 If you are planning a Mexican themed party for Cinco de Mayo, how about making a fringe pinata blindfold for your guests. You'll find the instructions for how to make them at Squirrelly Minds. Now that looks good enough to eat! 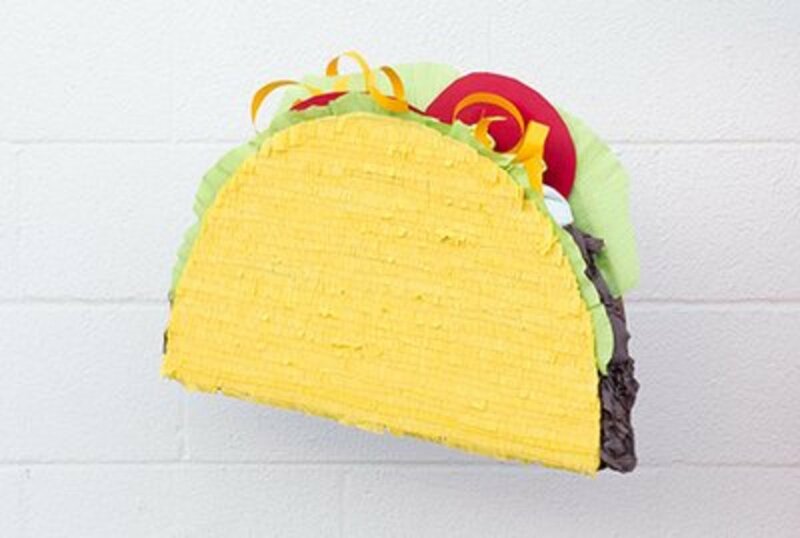 You'll find the tutorial for making this taco pinata at Studio DIY. 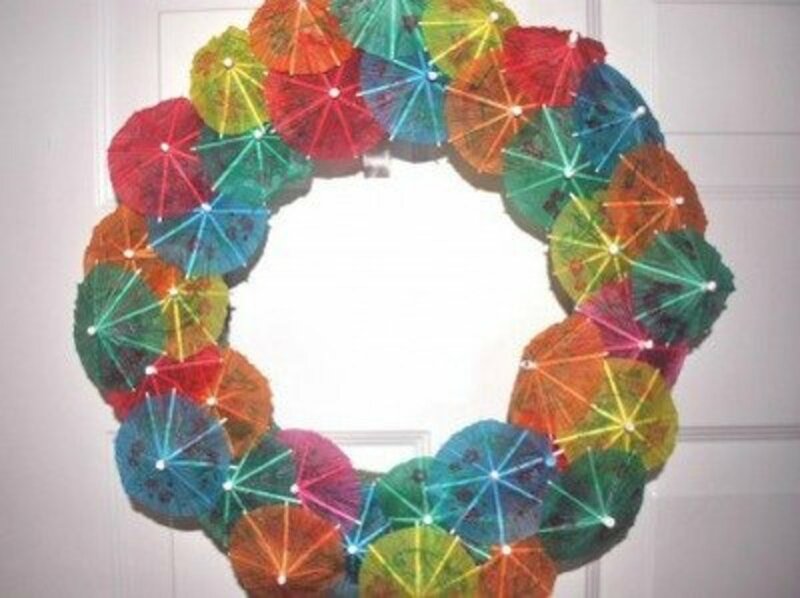 You'll easily find a great place to display this beautiful, bright colored umbrella wreath. You'll find all the information that you'll need to make this wreath at simply real moms. 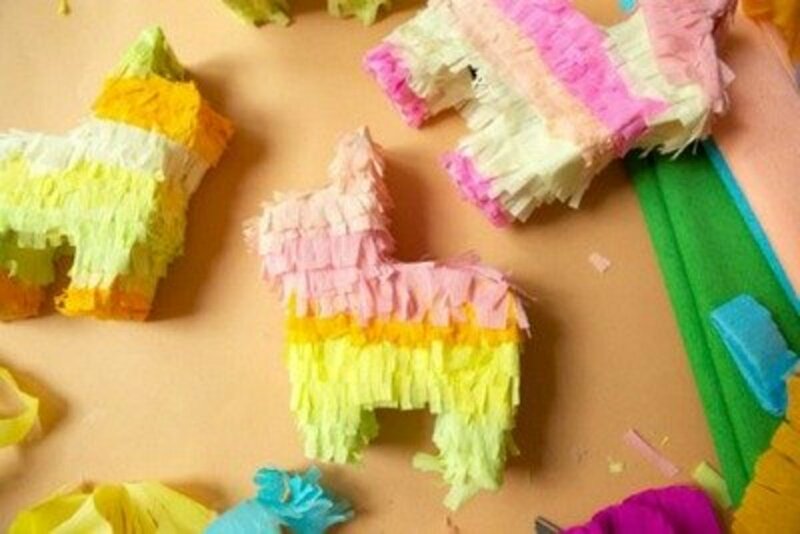 You'll find the information that you'll need to make mini pinatas at the studio DIY. site. Easy enough craft for the kids to make. 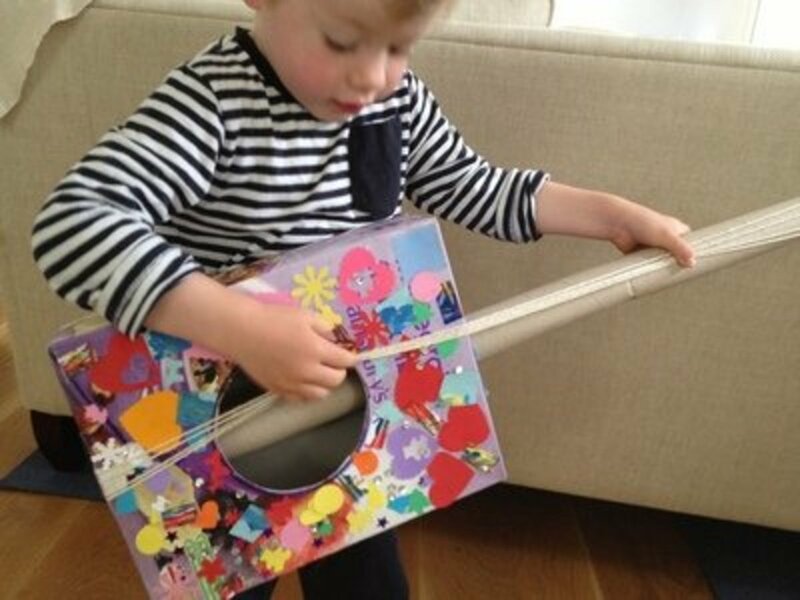 Help your little one make this guitar by following the instructions at My Kid Craft. The kids will need help making the guitar but the decorating with colors, cutouts or paint can be done by them. Add miracas to your band by making them following the directions that you'll find on SHE KNOWS PARENTING. The kids will be able to make music together. Beautiful candle light shines from these decorated glass vases. Make a centerpiece like the one shown by going to OHMY!Creative for the instructions. 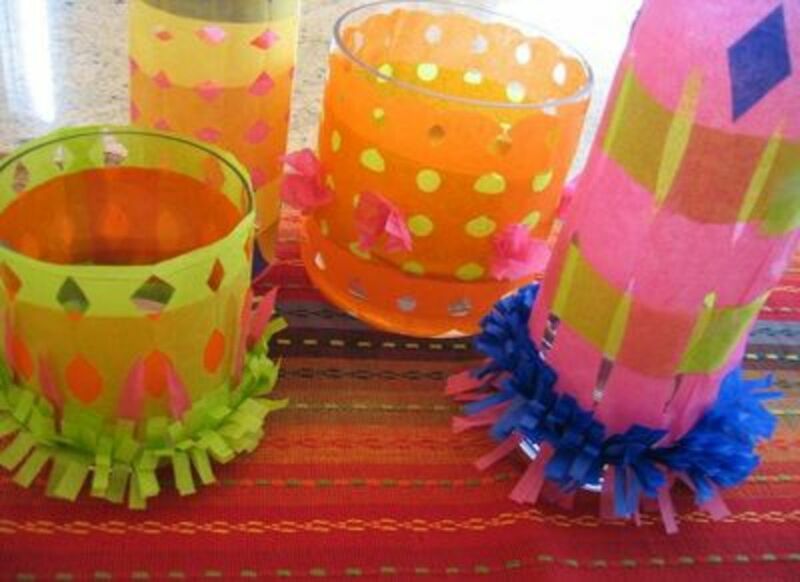 Even the littlest kids will enjoy making these sun catcher decorations to celebrate Cinco de Mayo. 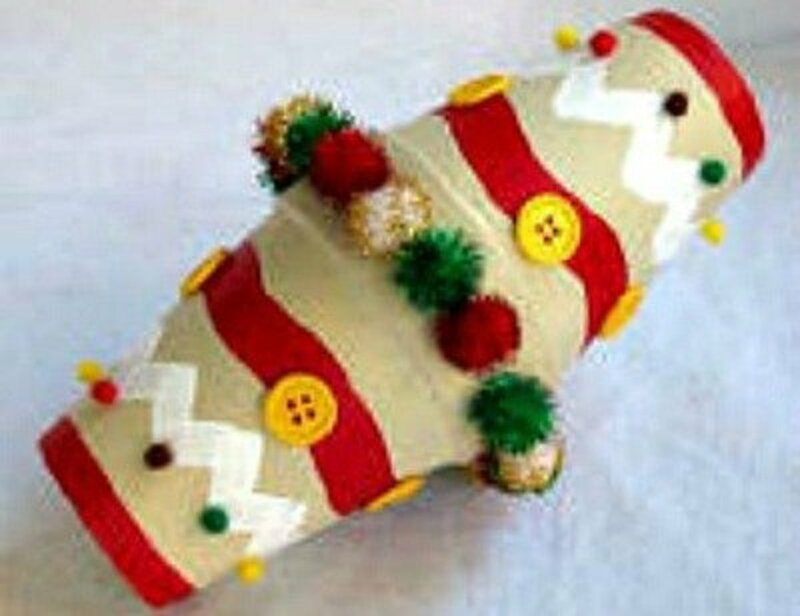 Find the instructions for this craft at inner child fun. This would be a great classroom project getting ready for the holiday. 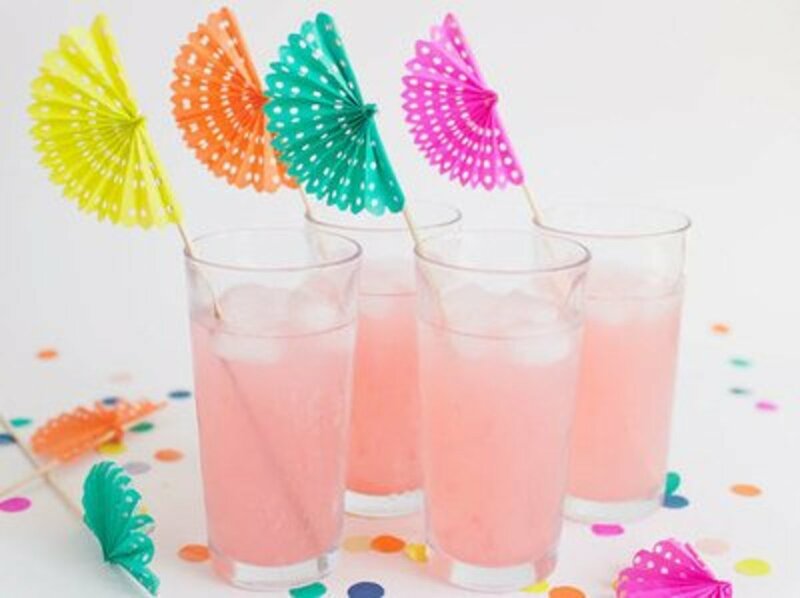 Dress up your party table with these drink stirrers. Go to Tell Love and Party for the directions.